NEW YORK, NY (Feb. 24, 2011) – “Irish” Micky Ward, more popular now than ever after the success of the Oscar-nominated movie about his life, The Fighter, has been invited by promoter Lou DiBella to be a special guest March 12 for the “Diamond Elite” event at the MGM Grand Arena at Foxwoods in Mashantucket, Connecticut. World Boxing Council (“WBC”) Emeritus and The Ring Magazine middleweight champion, 2010 Fighter of the Year Sergio “Maravilla” Martinez (46-2-2, 25 KOs), takes on World Boxing Organization (“WBO”) junior middleweight champion, Sergiy “Razor” Dzinziruk (37-0, 23 KOs), in the 12-round main event for the vacant World Boxing Council Diamond middleweight title. The chief supporting fight is “Celtic War,” pitting exciting middleweights Andy Lee (24-1, 18 KOs) of Ireland and Scotland’s Craig McEwan (19-0, 10 KOs), in a 10-round bout of ethnic rivalry with potential world title shot implications for the winner. The Martinez vs. Dzinziruk and Lee vs. McEwan fights will be broadcast on HBO’s World Championship Boxing beginning at 10:30 pm ET / 7:30 pm PT. 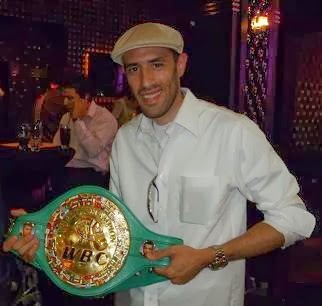 James “Buddy” McGirt: Ward got to know the former two-time world champion and 2002 Trainer of the Year, Buddy McGirt, up close and personal in 2002-2003 when McGirt trained Gatti for all three fights of their epic trilogy. “Buddy was a great trainer and great fighter himself. I’m still good friends with him today.” McGirt is Dzinziruk’s co-trainer. “Diamond Elite: Martinez vs. Dzinziruk” will be presented by DiBella Entertainment in association with Gary Shaw Productions and Banner Promotions. Lee vs. McEwan will be presented by DiBella Entertainment in association with Golden Boy Promotions. Both bouts will be broadcast live on HBO’s World Championship Boxing beginning at 10:30 pm ET / 7:30 pm PT. Tickets for “Diamond Elite: Martinez vs. Dzinziruk,” are priced at $450, $250, $125, $75, and $50 and on sale through the MGM Grand at Foxwoods box office. Tickets can be purchased online at www.mgmatfoxwoods.com, by calling the MGM Grand at Foxwoods at 1-866-646-0609, or in person at the MGM Grand at Foxwoods box office. For more information about DiBella Entertainment, including a list of all upcoming bouts, please visit www.dbe1.com, or follow Lou DiBella on twitter, @loudibella.